Using a laser sintering process and powdered metals, Solid Concepts manufactures the world’s first 3D printed metal gun. 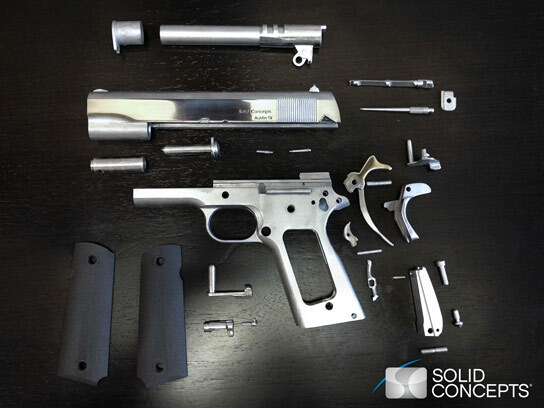 6 Comments on "Solid Concepts 3D Prints First Metal Gun"
Hot damn! M1911’s today, Dixon round actions tomorrow. Y’gotta love technology! You could have a really custom made handgun using the dimensions of a customer’s hand and altering the blue print of the handgun grip accordingly. You’d get a perfectly matched gun for the individual buying it. 3-D printing would make it possible. This indeed is awesome, but my big question is this. How much does this new 3D Printed gun cost? Is it cheaper, or comparable with traditionally made firearms? I wonder why the ammo description was not included? Is special ammo required? Why the complexity of having a laser and powdered metals? The water jet mini mill which was long anticipated seems to have taken a detour into big business instead of the small business boon it was anticipated to be. If I was a small business I would opt to purchase a water jet mini mill using standard metals. Think how much safer we will all feel when we can fabricate our own conversion kit to turn that encumbered semi-auto AR-15 into a true full-auto M16 killing machine — for defensive purposes only, of course! Anyone can google this and do it easily with basic tools from a hardware store. 3D printing not required.